Posted on Tue, Dec 7, 2010 : 9:56 a.m.
Ann Arbor City Council members can't use their private e-mail accounts to conduct city business anymore — at least not without violating their own council rules. Council members voted unanimously Monday night on new changes to the rules that govern their conduct inside and outside of public meetings. Newly added Rule 18 now states, "Council members shall use the city electronic mail system for their electronic mail communications for city business." Council Member Marcia Higgins, D-4th Ward and chairwoman of the council's rules committee, called it an effort to improve transparency and make sure that when council members are discussing the public's business — even electronically — it leaves a paper trail that becomes public record. "This keeps it all out in the public record for us," she said. "If there are any Freedom of Information requests, this allows that everything is present and accounted for." Sunshine laws like the Freedom of Information Act and the Open Meetings Act seek to ensure the public's business is done in the public eye. The advent of e-mail, however, has made it difficult to ensure that those laws — at least in spirit — are being followed. For example, elected officials sometimes find themselves discussing official business electronically using personal Gmail or Yahoo accounts. And those e-mails usually don't turn up when a citizen files a FOIA request for those records. Higgins said if council members feel the need to use their private e-mail accounts from now on, they have to at least copy their a2.gov e-mail account on the messages they send. Still, she said, it's preferred that council members just stick to using city e-mail accounts. Higgins said it's understood that council members will continue to use their private e-mail accounts to reach out to constituents through e-mail newsletters and such. She said that could be considered campaigning and shouldn't be done on city e-mail anyway. "This is really talking about when we have ordinances and resolutions in front of us, having that dialogue back and forth," she said of the application of the new rule. "We are making this so that future councils have this there and that this is an expected practice, and that council members can and will be held accountable for violating these rules." It'll have to be enforced, at least partly, through the honor system, she acknowledged. But council members will be encouraged to remind each other of the rule. Ann Arbor City Council Member Marcia Higgins, D-4th Ward, says new changes to council rules are intended to improve government transparency. 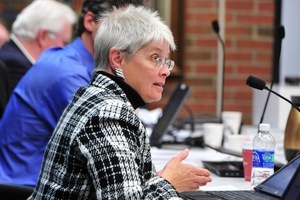 E-mail has been a controversial subject for the Ann Arbor City Council for the last two years, ever since it was discovered that council members regularly e-mailed each other during city meetings. A new rule implemented last year effectively banned the exchange of e-mails during meetings, with few exceptions. The latest rule change is something local attorney Noah Hall was pushing the City Council to approve earlier this year. He and the Great Lakes Environmental Law Center filed a lawsuit accusing members of the City Council of secretly discussing the South Fifth Avenue underground parking structure project via e-mail instead of deliberating in the public eye. "We learned through the city's responses to our FOIA requests that some council members were regularly using commercial or personal e-mail accounts to communicate with other council members," Hall said in March. "There's nothing illegal or wrong about that. The concern, though, is that if council members are using their private or commercial e-mail accounts to communicate with each other, there's no way for the city's staff and the city attorney's office to manage all those records so that they can produce them in response to a FOIA request." Wed, Dec 8, 2010 : 10:28 a.m. I totally agree with Greggy_D... The thought of using my personal e-mail account for company business would never cross my mind. For work I have a record of e-mail going back many years. I often search it for valuable information. If I had some of my business on my personal e-mail account, my effectiveness on my job would be reduced. Another example of unprofessional behavior by the AA City Council. Tue, Dec 7, 2010 : 1:55 p.m. If there was "government business" sent by non-government e-mail carriers cannot that information also be FOIAed? If so.... a council member that might find some of their "private" mail being "inadvertently" made public. Doing government business using government accounts makes so much more sense... for all of the reasons stated in the article and it protects a council member's privacy. Tue, Dec 7, 2010 : 1:52 p.m. So the City Council makes another rule when they weren't following the first rule? You can't make this stuff up. Tue, Dec 7, 2010 : 11:52 a.m. Okay, so the controversial conversations will still take place over the phone (PHOIA that!). My question is, when will council leave their laptops closed as a default and only consult them if they absolutely need to? We need all the bulbs operating as brightly as possible during public commentary and deliberation. Tue, Dec 7, 2010 : 11:47 a.m.
Hard to find fault with this policy. But how much of a paper trail will be left anywhere after everything is outsourced and all accountability and decision making is given to another group? Tue, Dec 7, 2010 : 11:26 a.m.
Good move in regards to transparency and accountability. Tue, Dec 7, 2010 : 11:06 a.m. This seems like a no-brainer. I would never use my personal e-mail account for any type of business related to my job.